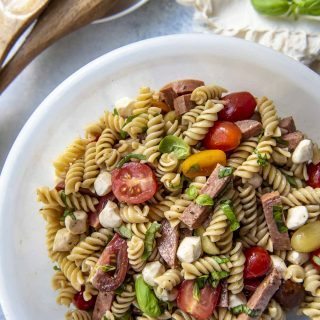 This Easy Caprese Pasta Salad is a summer favorite that’s ready in no time! 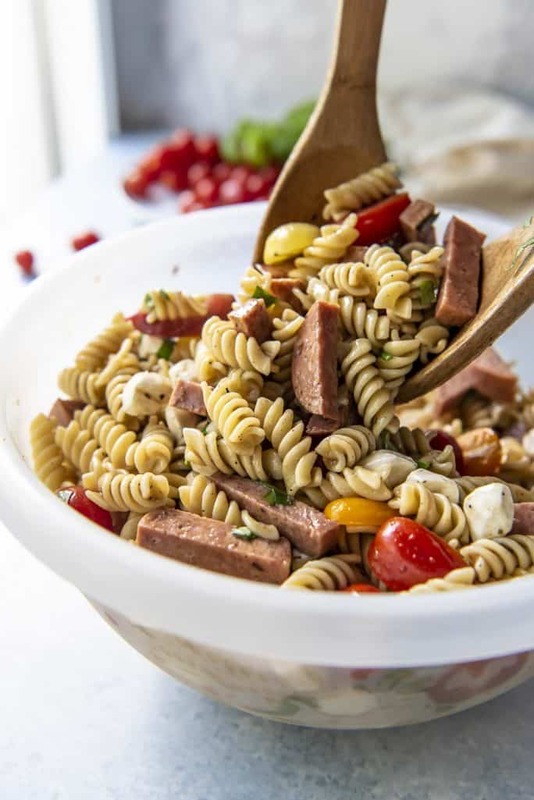 Rotini pasta, salami, mozzarella, basil, and grape tomatoes come together with a fresh balsamic vinaigrette in a simple and completely delicious potluck side dish that’s perfect for any cookout, party, or light lunch. So I might be a day late with this pasta side dish…it would have been completely perfect for Memorial Day weekend. Thankfully, yesterday was the summer kickoff, and you’ll have plenty more opportunities to throw it together! Even if you’re like me and just make pasta for pasta’s sake. 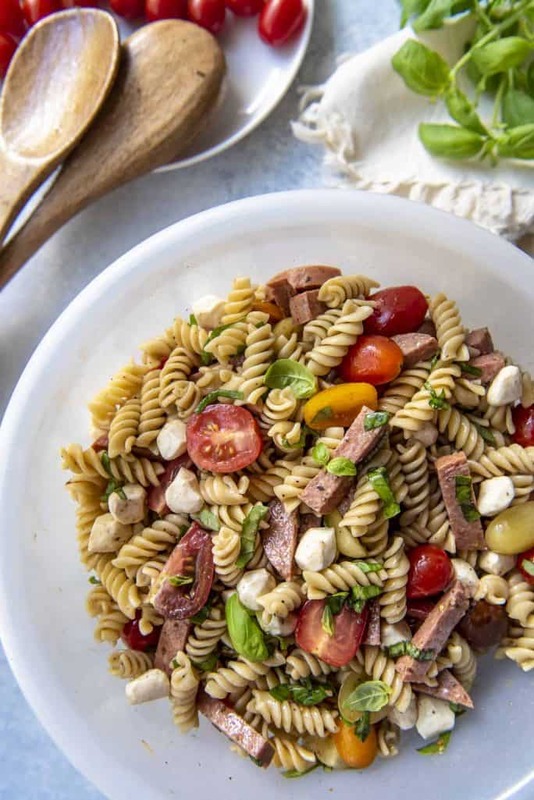 This easy Caprese Pasta Salad is totally irresistible. 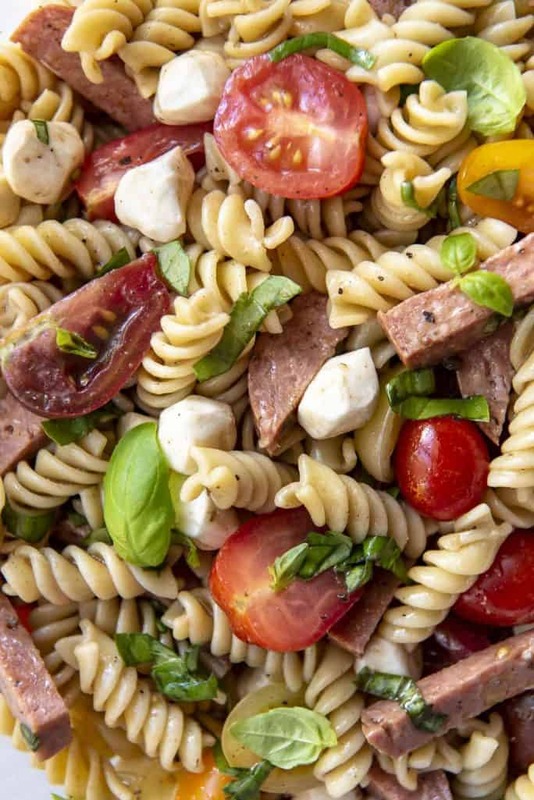 For both caprese salad and easy pasta salad lovers alike – this is the ultimate mash up. 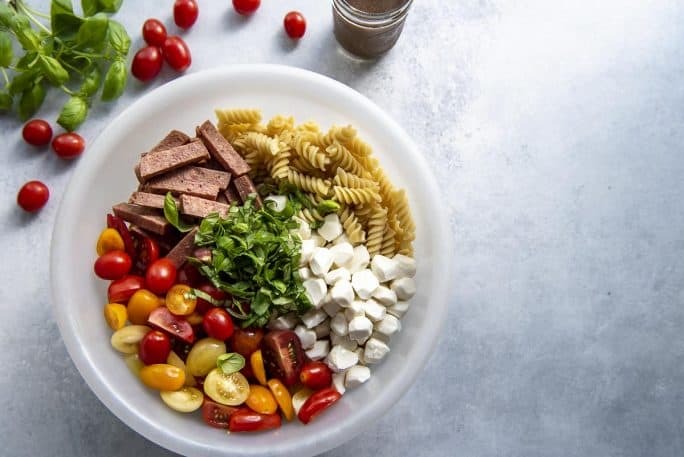 Can I get a hell yeah for tender pasta, juicy tomatoes, fresh basil, and tiny bites of mozzarella kissed with balsamic vinaigrette!? And if you add some cubed up salami, you can happily call it dinner. You’ve got most of your food groups covered! This pasta dish is unlike those mayo-based picnic staples in that it’s a lot lighter and more pleasant to eat in the heat of a summer day. The pop of the grape tomatoes and the brightness of the balsamic will have you going back for scoop after scoop. You might even be tempted to eat it straight from the serving bowl! And you know I’d never judge you for that. We home chefs have to taste our food to make sure it’s good, too! There are only 5 ingredients this salad requires…anything else is just a bonus! Pasta – I love to use rotini because of how the spiraled noodles capture the dressing. Other great options for this recipe are bowties, orecchiette, and even tortellini for a heartier version. Mozzarella – Pearls were used here thanks to their size and ease of use. For a more rustic look, cube or tear pieces from a larger ball of cheese. Tomatoes – If you love the pop of grape tomatoes as much as we do, they’re perfect here! Quartered cherry tomatoes and sliced heirlooms will be equally juicy and colorful. Basil – Don’t skimp on the fresh basil! Whether you use Genovese, purple, or sweet Thai, dump in as much as you can handle. It makes this salad! Balsamic Vinaigrette – Homemade or store-bought is your choice! Round out the caprese flavors by skipping traditional Italian dressing for a balsamic-based one. Extras – Salami, pepperoni, olives, crunchy summer veggies, a sprinkle of Parmesan. Feel free to make this salad your own, but don’t go too crazy or you’ll lose the caprese feel! 1. Boil the rotini as instructed on the package, then drain and rinse with cold water. Set aside. 2. Place the rinsed pasta in a large serving bowl with the remaining ingredients. 3. Pour the balsamic vinaigrette on the salad and mix well. 4. Cover and refrigerate for at least 2 hours. Serve with more vinaigrette and extra fresh basil leaves, as well as salt and pepper if desired. Loving this pasta? Try these other perfect summer picnic recipes! 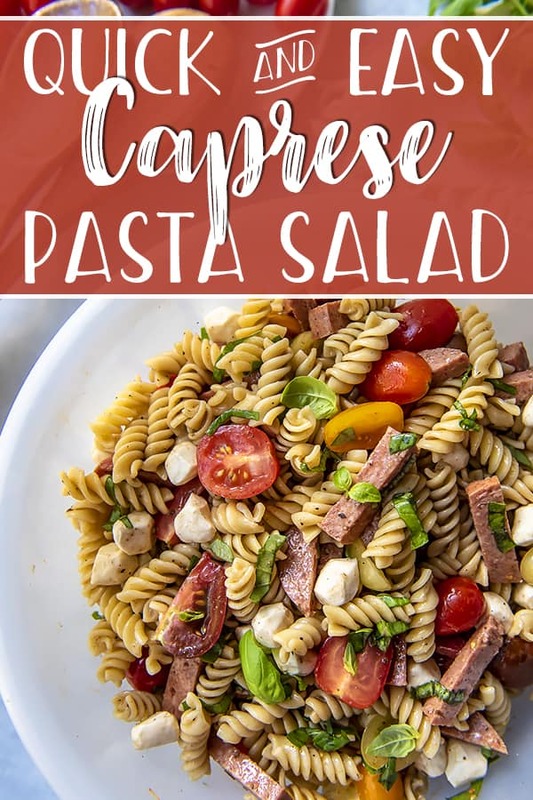 This Easy Caprese Pasta Salad is a summer favorite that's ready in no time! 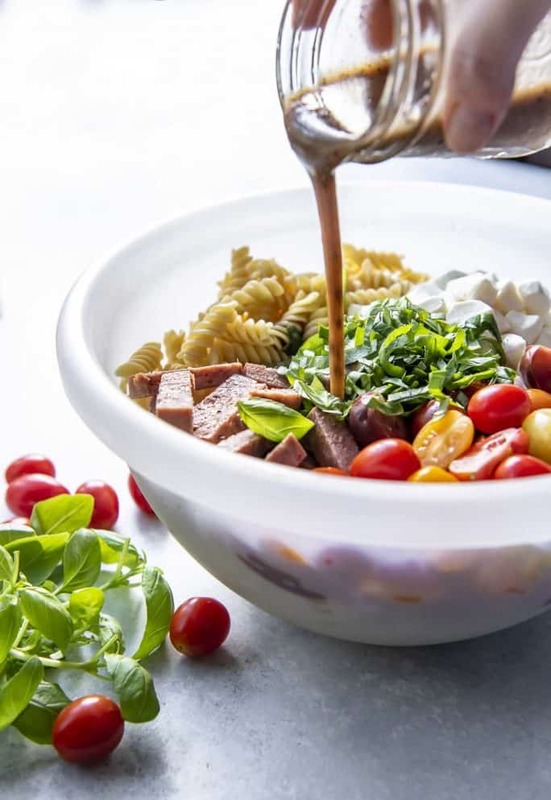 Rotini pasta, salami, mozzarella, basil, and grape tomatoes come together with a fresh balsamic vinaigrette in a simple and completely delicious potluck side dish that's perfect for any cookout, party, or light lunch. Boil the rotini as instructed on the package, then drain and rinse with cold water. Set aside. Place the rinsed pasta in a large serving bowl with the remaining ingredients. Pour the balsamic vinaigrette on the salad and mix well. Cover and refrigerate for at least 2 hours. Serve with more vinaigrette and extra fresh basil leaves, as well as salt and pepper if desired. 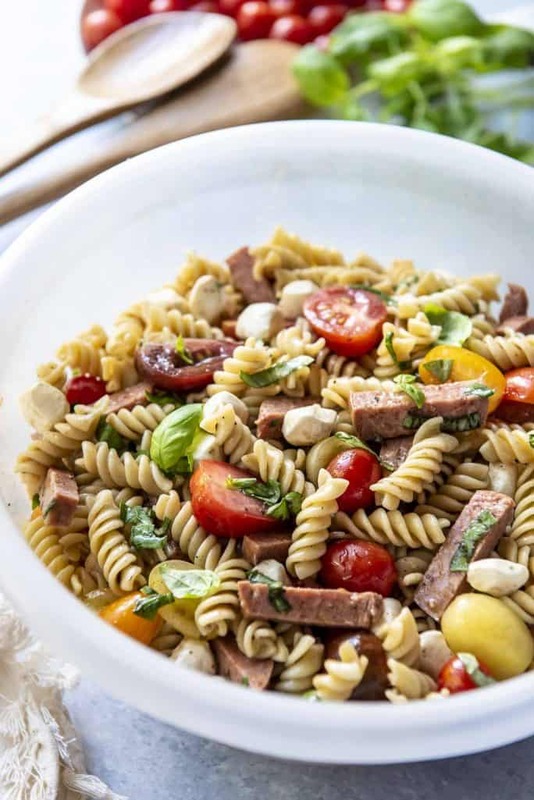 PIN THIS CAPRESE PASTA SALAD RECIPE FOR LATER!